Avoid pre-heating an empty saucepan and never allow this to boil dry. When seasoning your food remember to heat the water to boiling point first, especially before adding salt. This disperses the salt quickly and prevents pitting of the stainless steel lining. Apply a light coat of vegetable oil to cast iron handles from time to time to prevent rusting. 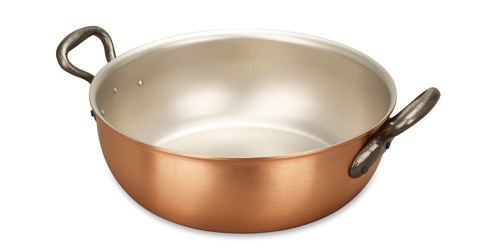 We know you'll love this	24cm copper stew pan	as much as we do. 5 stars out of	5 based on	3 reviews. My day to day beautiful work horse of a pan. I love this pan - it was delivered to my work place, couldn't resist opening it to the admiring looks of my colleagues (copper pot jealousy caught like quick fire). This pan is never off the top of my gas hob, I use it almost every day and it meets the needs of my three people house hold easily, and would also provide room for 4 adult meals as well. I bought lid, which I have to say I think is essential for slower cooking with the pan. The cooking surface is so smooth - NOTHING STICKS! I have two Falk pans, and they meet my cooking needs, but somehow I think I will be back for more. Robust, beautiful and easy to use. 1135 customers found this review helpful. Did you? Yes, I did! Best copper cookware in the world! I have to be honest, when I read on chowhound that Falk Culinair was considered "the best copper cookware in the world" by several posters, I was a teeny bit sceptical. Now I am convinced! I will definitely be back to add to my collection. 1047 customers found this review helpful. Did you? Yes, I did! Copper stew pan I have had this lovely piece for some time and get great pleasure every time I use it. It is reassuringly heavy but not so heavy when full and the two handles make it easy. Oven to table makes a great centre piece. 1033 customers found this review helpful. Did you? Yes, I did! All Time Favourite Honours of being the most used cooking vessel in my collection to date. A must have all rounder. Motto "Inherit Tin, Buy Stainless Steel"
1006 customers found this review helpful. Did you? Yes, I did! Good size I purchased stand for my sister large 24 stew pan. She was so pleased with the pan and also agreed a good size for family. 976 customers found this review helpful. Did you? Yes, I did! 948 customers found this review helpful. Did you? Yes, I did! Good pan Good size for everyday family cooking - used on hop as saucier too. 923 customers found this review helpful. Did you? Yes, I did! 'Beautiful' versatility... The great thing about quality cookware is that 'one piece replaces 10'! The ingeniously rounded sides and practical depth of this stew pan give it 1001 uses beyond the average saucepan. Not only are traditional casseroles & braised dishes cooked to perfection; but layered dishes such as Alsation Baeckeoffe & Lebanese Fattée can suddenly be made in just one pan! It's also great for 'moulded'recipes such as the classic French Chou Farci, & due to the thermal conductivity of copper, you can also use it for 'chilled' dishes, such as an English Summer Pudding. I recommend this for the best syrup sponge-pudding you'll ever make or delicious pot-roasted gammon, which can be served straight from oven to table because the copper looks so beautiful! A definite 5-star product that's immediately become my new kitchen favourite! 893 customers found this review helpful. Did you? Yes, I did! One of my favorite This is the one of my colection Falk which I recommend because you can prepare dinner for two people! Very useful to cook а stew! 853 customers found this review helpful. Did you? Yes, I did!